Nikon’s new D610 is the smallest and lightest full-frame DSLR on the market, replacing the popular D600 as Nikon’s cheapest FX-format model. 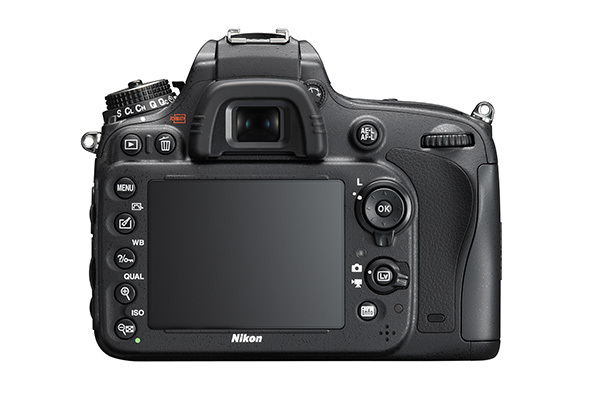 Unlike earlier advanced DSLRs like the D300S, which enjoyed a life span of three years, the D600 was succeeded after only a year, so Nikon users may be surprised to see it replaced so soon. The most likely explanation is a design flaw that caused dirt to settle on the D600’s sensor, resulting in images covered with black spots, especially in the top left-hand corner. Nikon described the contamination as ‘dust’, though many claimed it was an oily substance leaking out onto the shutter mechanism and then flicked onto the sensor. Being a recurring problem, cleaning the sensor was only ever a temporary fix. Thankfully, Nikon has completely redesigned the D610’s shutter mechanism, so no unexpected dust finds its way onto the sensor. The new shutter also enables a slightly faster continuous shooting speed of 6fps instead of 5.5fps, and it introduces a new Continuous Quiet mode for a fast shooting speed with minimal shutter noise. The only other notable difference is an improvement to the white balance, which is more accurate in artificial lighting conditions and has more realistic skin tones. This aside, the D610 is exactly the same as its predecessor, so if you’re already a D600 owner, feel free to stop reading now. For everyone else, let’s take a closer look at some of the D610’s key features. The 24.3MP D610 is baby brother to the D800, which has the same sized sensor but a much higher resolution and a considerably heftier price. In DXOMark’s Camera Sensor Ratings, the D610’s sensor is rated the second best of any digital camera ever tested. That’s an impressive accolade, so anyone considering investing in a D610 can rest assured that image quality, depending on the lens being used, is about as good as digital cameras get. In our own in-studio and real world tests we came to the same conclusion, with the D610 producing very high quality images with excellent colour depth, high dynamic range and impressive ISO response. The D610 comes with a 3.2in 921k-dot LCD screen, though it’s not in a 3:2 ratio so images don’t fill the entire area unless you’re zooming in. The screen lags behind the Canon 6D’s due to the lower resolution, weak blacks and lack of anti-glare or anti-smudge coating. The 6fps shooting speed makes the D610 perfect for sports and wildlife, as does the impressive battery life of 900 images from a single charge. With two SD card slots, users won’t need to change cards as often, or they have the option to save images to both cards. The D610 shoots Full HD (1080p) video and has both a headphone and a microphone socket, features missing on the Canon 6D. The D610’s 39-point AF system, which includes nine cross-type points, is fast and accurate, even in difficult lighting conditions. 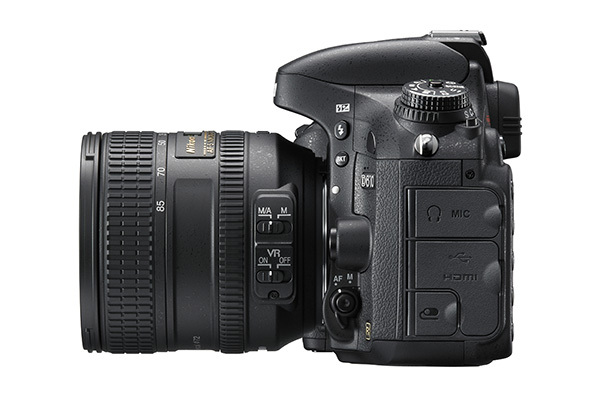 The D610 comes with a 24-85mm f/3.5-4.5 lens with built-in Vibration Reduction. It’s perfect for landscapes at its widest focal length, and portraits fully zoomed in, and VR is very useful for low light shooting and video. Lens quality is fairly good, with little to no chromatic aberration across the whole zoom range, even wide open. Lack of sharpness is only a problem at 24mm at wider apertures where there is softness in the corners. Fully zoomed in, corner sharpness is minimal at all apertures. Pincushion distortion is very pronounced at 85mm and barrel distortion is severe at 24mm. 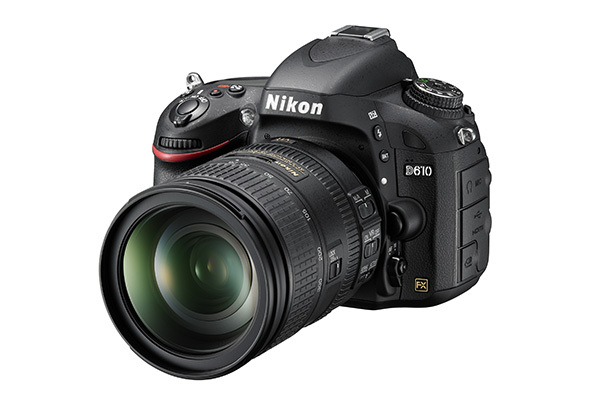 The D610 has a well-built, weather-sealed body that handles intuitively and has an easy-to-navigate menu system. Even though it’s a small body for a full-frame model, it still feels very comfortable to hold, even for users with larger hands. The camera body has plenty of direct access controls, convenient finger and thumb dials, and an LCD display on the top-plate. The built-in spirit level is very useful for landscape images, especially when the horizon is uneven, and mirror lock-up is accessible without having to go into the menu. One niggle with the D610 is that you have to hold in a button and turn a dial at the same time to change ISO and exposure compensation, which is a fiddly way to access two of the most frequently changed settings. The D610 also lacks a large dial on the back, which is found on all full-frame and enthusiast Canon models. The D610’s low light performance is impressive, with relatively noise-free images up to ISO 3200, and useable images even at the maximum native ISO of 6400. That said, the D610’s ISO range of 100-6400 is a little shorter than its main competitor, the Canon 6D, and images display marginally more noise at higher ISOs. The D610 has an expandable ISO setting up to 25,600, though as expected, noise is very severe so images couldn’t really be used at any great size. This is an excellent camera, arguably offering more bang-for-your-buck than any other full-frame DSLR. It doesn’t have the image resolution of the D800, but it has more manageable file sizes, a faster shooting speed and two custom user modes. Some users will be disappointed that Nikon hasn’t added more new features to the D610, such as Wi-Fi, but at least the sensor issue that plagued the D600 has been fixed. If you’re looking to invest in an affordable full-frame DSLR, this model has exceptional sensor quality, excellent handling and is at least as good as Canon’s 6D.